I am an experienced and trained counsellor for when you looking for help with a couple relationship or want to examine being alone in more detail. PLEASE NOTE: If you are feeling suicidal right now, counselling may not not be suitable as a first step. Please visit The Samaritans (UK) or Befrienders International for help and information. Online clients use emails or online chats to speak about their problems. Some clients use a mixture of face-to-face and online and others use a mixture of voice or video chat and emails. The choice is up to you and you can change your mind if a particular method doesn't suit. If you are wishing counselling on your own I will respond by Therapeutic Emails. 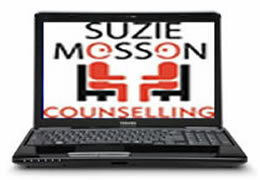 If you are wishing counselling on your own I will respond by Therapeutic Emails. This will be in response to any number of emails sent by you and will generally take me around an hour to complete. There is no charge for any email in response to something you need to find out. Emailing for couples is a little different. Each of you will email my safe address individually but will receive a composite reply delivered to your inboxes. I use a specific password protected computer which is held securely and has both firewalls and virus checker. Therapeutic emails are sent and received from a free encrypted service. This means no-one can eavesdrop on our messages. Skype is free to download from the internet, easy to install and set up, and, most importantly, is confidential. I use Skype. It is free to download from the internet, easy to install and set up, free of adware / malware / spyware etc. and, most importantly, is confidential. If you want to book a chat session please give me notice to allow me to ensure there is a suitable appointment in my diary. For both methods of online counselling payment will be paid in advance by either Paypal or directly to my bank account via the invoice instructions. The email address which is used to identify me is suzie@suziemosson.org and I will send you an invoice. As a fairly new medium for counselling I am aware you may have many, many questions to ask about security, logistics or whether it is appropriate for you. Please ask me, I really don't mind.